Aneesh Ankur moderated the session and further discussed with Prof. Sudheesh Pachauri on the topic. Elaborating on the subject Prof. Pachauri said, “Popularity of every literature increases with time”. He further said, develop such literature which will impact the entire mass, not just the few people. He said as the time is changing, writers must write something which will entertain their readers. Now a days readers have many options to entertain themselves, given the situation, why would readers read your writings? 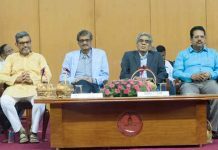 While explaining about the popularity of literature Prof. Pachauri discussed about Bhakti era and emphasized that Bhakti is also a full package of comedy. This is the reason why, serials like Ramayan and Mahabharata were so popular in our neighboring countries. Commenting on Serious Literature Prof. Pachauri said, Tulsidas had created so many compositions but what happened, his last moments were so painful. Karl Marx also said that religion is heartless world soul. Evergreen writers like Nagarjun, Renu and Dinkar were actually very popular because their writings contains pain of the general public. Nagarjun wrote lots of poems on Indira Gandhi but it never created problem for him. Prof. Pachauri said 80 crore of population knows hindi, out of which all poets live in Delhi. Now you only figure out how many composition can be written according to this scenario. Writers been awarded before the publication of their work. If popularity is your thing then you have to write like a necklace for the readers. 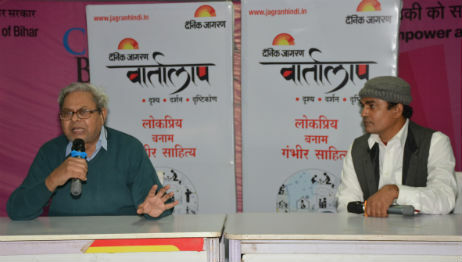 Jagran Vartalap was well attended by eminent personalities of the city and saw the presence of writer and journalist Anant vijay, poetess Nivedita Jha, IG of CISF Mr. I.C. Pandey, film critic Vinod Anupam, and writer Ratnesh.